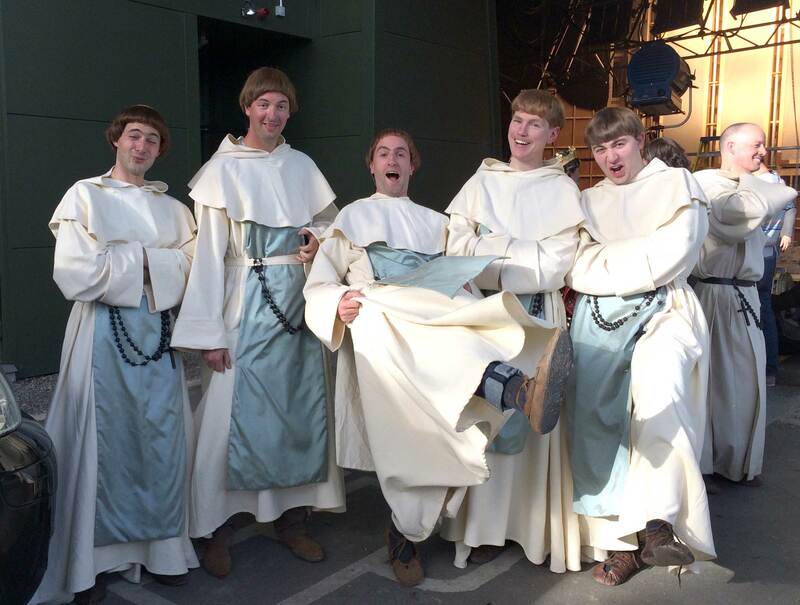 Vikings first contacted me in 2013 about providing some singing monks for an upcoming episode. The location was not far from my home and I seized the invitation. Crux has been performing for Vikings ever since, even as recently as a week ago. It’s a great team of people and a lovely studio to work in (Ashford) The hair and makeup people are in a cheery mood first thing in the morning, the catering is superb and Stephen and co always make us feel very welcome, the other extras too. Keen to know just how a hugely successful show like this is made, it’s exciting to get up close to the sets, the costumes, the actors, the crew and equipment. The level of craft and attention to detail in the set design is extraordinary, all built with surprisingly solid materials which adds great realism to our Viking surroundings. 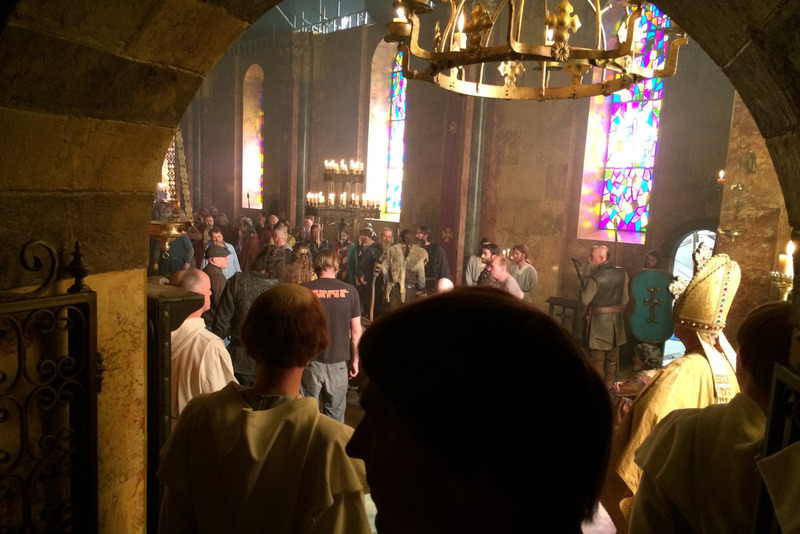 The set is typically chock-full of cast and extras with crew weaving between them: the chaired directors, the headphoned sound crew, lighting and smoke dispersers, actors’ personal assistants and make-up fixers, guys with blowtorches attending a legion of dripping candles, the consultant historian, the focus-pullers peering into their green monitors, the person handing out bottled water… From the macro to the micro it’s dizzying complex system; it’s commerce and art in harmony. Normally I receive the chosen repertoire from the Vikings music team (Canada) some days in advance, conduct some research into pronunciation, style, etc and prepare the men in rehearsal. Crux (mostly) consists of professional, full-time singers who can all sight-read, meaning if I place the printed music in front of them and press ‘go’, they’ll sing it – a rare, but useful skill. 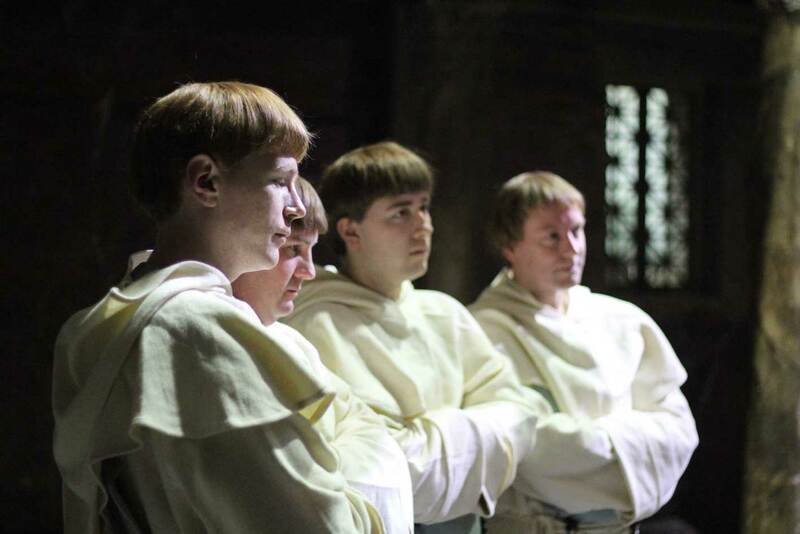 However, in the case of music of the Viking era, paper was not available, books (of vellum/leather) very scarce and monks would have memorised their music by listening to their elders. Continuing this time-honoured oral tradition extending back many centuries, the men of Crux come to Ashford studios carrying their melodies in their heads. 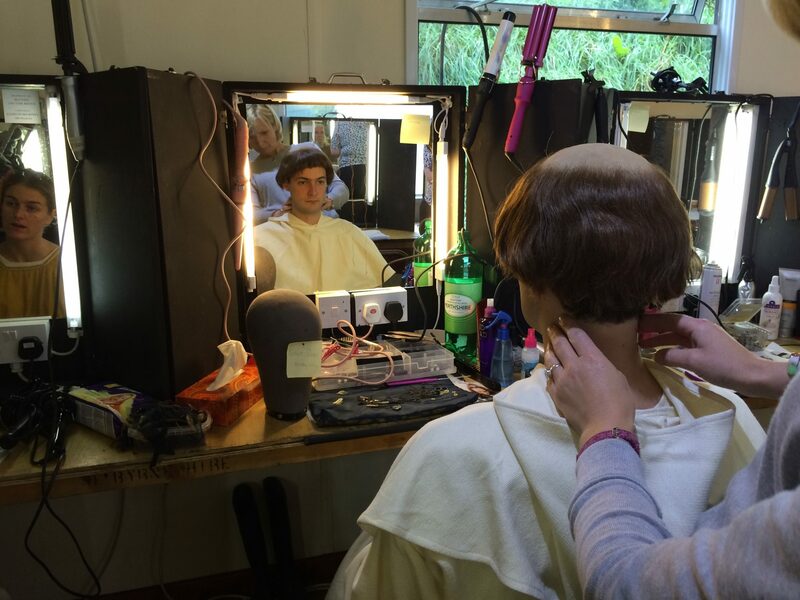 Generally our day starts with costume and wig-fitting. 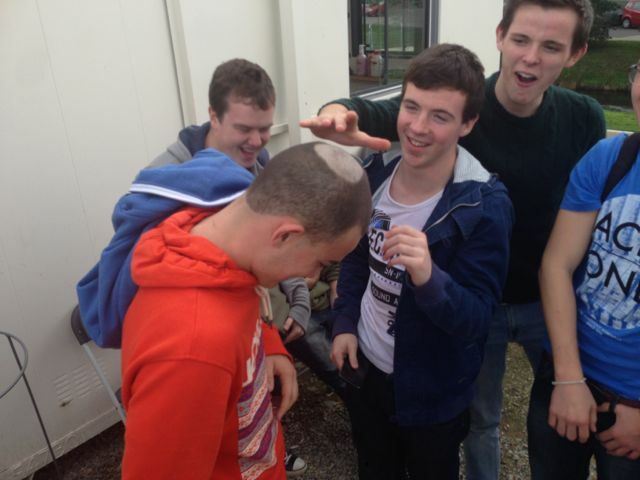 In past times monks would shave the tops of their heads as a symbol of their willingness to abandon personal vanity. Some of our younger singers have gone for it, but generally speaking the guys of Crux are not keen on chastity or a cold scalp. Wigs present a realistic compromise in the ongoing struggle for authenticity. Our robes are made of scratchy woollen materials; bulky and warm. No pockets for iPhones, devastatingly. Beads and crucifixes are hand-carved and stitched leather boots come with free Wicklow mud. Monks are creatures of habit and we sing our chant repeatedly to find synchronicity. 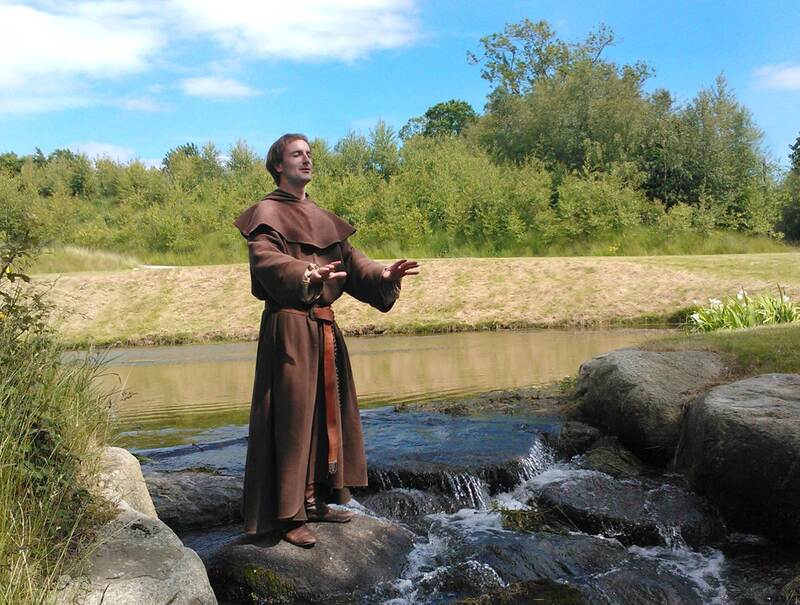 Our ‘dress rehearsal’ usually takes place by the little stream that runs through the studio grounds. Here, the monks connect with nature, pray themselves into character, chant for inner peace. Then they buzz off to check social media gossip, indulge in excellent catering, slouch around and generally take the mickey until called again – much like they would have more than a thousand years ago. Once on set, the shoot duration can be unpredictable. We may be asked to sing our chant five, ten, twenty times depending on the number of takes and angles required. The dense smoke catches in the throat as the day wears on, backs grow tired from standing but the chant grows stronger. 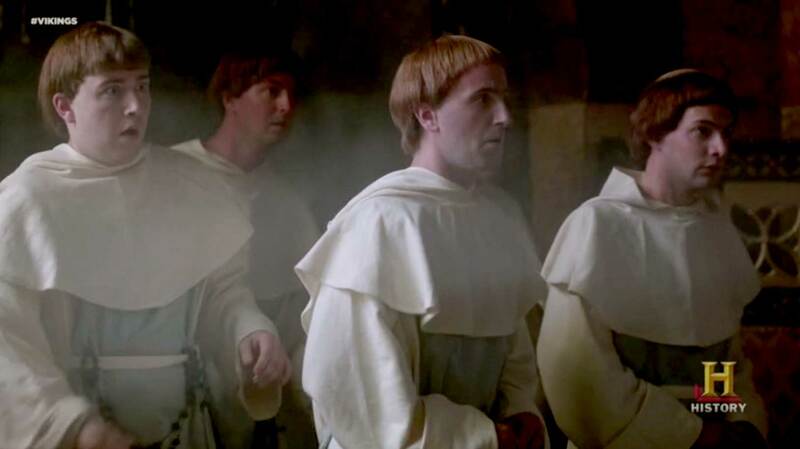 An intimacy develops between singing colleagues, and the monks that once sang together several times per day must have known by each other’s voice their brothers’ state of health and mind. It’s something I only experience now in the choir of St. Patrick’s Cathedral, Dublin where myself and some members of Crux sing seven times a week together. 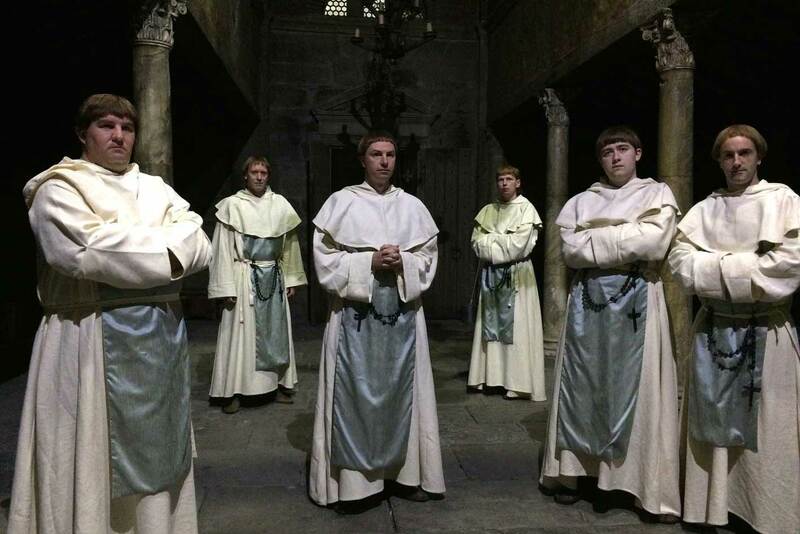 Crux has a long connection with St. Patrick’s with many performances since the group was first formed there almost ten years ago (more info in this article). Nearly all the chant of Vikings is chosen from the Christian repertoire passed down to us by oral tradition and written down from the ninth century. As such, it’s likely this music has undergone many changes with time, with many experts believing the chant performance would have been faster and freer than it is typically heard today (something Crux explores on Sunday mornings at St. Mary’s Church on Haddington Road, Dublin. Details here).